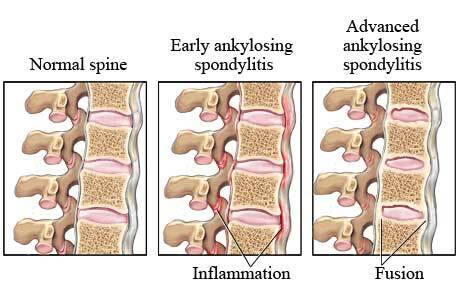 Ankylosing spondylitis (AS) is a disease causing pain, stiffness and decreased movement in the spine and swelling and pain in the joints. Those four diseases are similar. 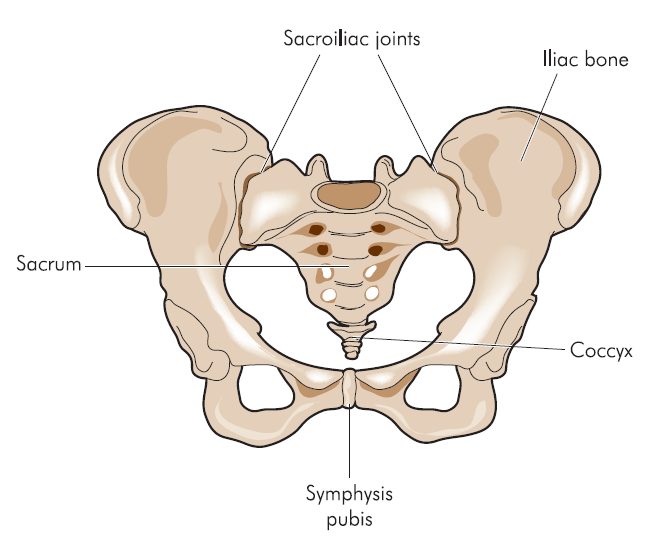 It is known that ankylosing spondylitis and arthritis related to the IBD more often causes the involvement of the both sacroiliac joints looking alike on the MRI or on the radiograph. Psoriatic and reactive arthritis usually show the disease more prominent on one side. “Ankylosing” means joining together and refers to an inflexibility between the vertebrae. “Spondylitis” means inflammation of the vertebrae. Spondyloarthritis is classified into “axial” and “peripheral” spondyloarthritis depending if it involves mainly the spine or in the extremities. Patients with AS often develop enthesitis. It is the inflammation at the area of insertion of the ligament into bone. The common sites of enthesitis are sacroiliac joints, spine, Achilles tendons, knee caps, sides of the hip joints, and capsules of large joints. Most commonly affected joints are hips and shoulders. People with ankylosing spondylitis may be tired and may feel unwell. Difficulty sleeping, caused by back or joint pain at night, may contribute to fatigue. Low-grade fevers and weight loss occur in some patients. Ankylosing spondylitis is three times more common in males than in females. It is usually diagnosed in young adults between the ages of 20 and 30 years. The disease can be more common in certain families. For example, a person’s risk of developing ankylosing spondylitis increases if a first-degree relative (parent, sibling, or child) has ankylosing spondylitis. The presence of a gene called HLA-B27 may also increase the risk of developing ankylosing spondylitis. Ankylosing spondylitis can affect daily life. Dressing, reaching, rising from a chair, getting up from the floor, standing, climbing steps, looking to the side or over the shoulder, exercising, and doing household or work-related tasks can become more difficult as a result of the decreased joint and spinal motion in ankylosing spondylitis. Ankylosing spondylitis often starts with the inflammation in the sacroiliac joints (picture on the left) and ascends to the higher levels of the spine. Sacroiliitis may present with the pain in the upper buttocks that is worse with the rest and at night. Occasionally, people with ankylosing spondylitis develop inflammation in the eyes, called iritis or uveitis. 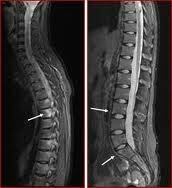 The diagnosis of ankylosing spondylitis is based on patient’s symptoms, examination, and imaging tests. Imaging tests such as magnetic resonance imaging (MRI) are good in the diagnosis of AS when it is early. Radiographs are able to show more advanced disease. There is no blood test that, by itself, is capable of diagnosing or excluding ankylosing spondylitis. Testing for the HLA-B27 can be helpful in some groups of the patients. Ankylosing spondylitis is unlikely in a patient with a negative test for HLA-B27. Ankylosing spondylitis is even less likely if the radiographs and MRI are normal or show no changes to suggest ankylosis of the sacroiliac joint or inflammation in that area. The HLA-B27 test is primarily ordered to help strengthen a suspected diagnosis of ankylosing spondylitis, or sometimes anterior uveitis. The HLA-B27 test is not a definitive test that can be used to diagnose or rule out a disorder. It is one piece of evidence used along with the evaluation of signs, symptoms, and other laboratory tests to support or rule out the diagnosis of certain conditions, such as ankylosing spondylitis and reactive arthritis. HLA-B27 is a blood test to look for a protein that is found on the surface of white blood cells. The protein is called human leukocyte antigen B27 (HLA-B27). Human leukocyte antigens (HLAs) are proteins that help the body’s immune system tell the difference between its own cells and foreign, harmful substances. HLA-B27 appears in 80-90% of patients with ankylosing spondylitis. It means that HLA-B27 positive individual is approximately 87 times more susceptible to developing ankylosing spondylitis compared to the general population. This test can be positive in some people who never developes ankylosing spondylitis as well. Therefore, this test is used to support the suspected diagnosis of ankylosing spondylitis but not to confirm it. Exercise should be part of the treatment program of all patients with ankylosing spondylitis. It can include home exercises, individual or group exercise with a physical therapist, or physical therapy (PT) treatments. The exercise should consist of posture training, deep breathing, back extension, and other stretching movements. It should be a part of a daily routine life long. Any exercise you decide to undertake needs to be regular, consistent and kept up over the long term. A wrap-around rear view mirror can improve visibility for drivers who cannot turn their head and neck. An NSAID on a regular basis is commonly used to control pain and stiffness. Sulfasalazine may be given to slow down the disease. It may be given along with NSAIDs. This drug provides some relief of arthritis symptoms but is not helpful if ankylosing spondylitis only affects the spine. Anti- TNF medications, new medications called biologics are often effective in the treatment of ankylosing spondylitis. People who do not respond to one anti-TNF treatment may respond to another. In general, people with active disease in the spine who have not responded fully to NSAIDs are the candidates for this treatment. Steroid injection into painful or swollen joints can be indicated. Hip or spine surgery may be beneficial in some patients with advanced ankylosing spondylitis. 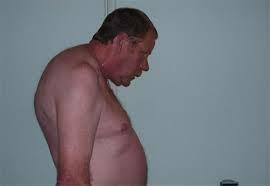 Maintain correct posture, and participate in an exercise program. Consume an adequate amount of calcium and vitamin D in order to reduce the risk of bone loss (osteoporosis). Products that contain calcium and vitamin D include dairy products like milk, cheese, and yogurt or calcium and vitamin D supplements. Arthritis society website address can be found under the “Useful links”. It is a self referring service.